The Readings of the Paul Solomon Source “The message is: There is a Great Power that can be tapped and can be experienced by anyone.” These are the words of Paul Solomon, one of the most influential spiritual teachers of our time. Internationally known as a teacher, prophet, healer, minister and humanitarian, Paul Solomon made contact with his Super-conscious Mind after experiencing a “dark night of the soul.” Paul Solomon could ‘view the body’ at a distance, make accurate diagnosis and suggest treatment that saved lives. During his lifetime he gave over 1,400 readings on topics such as Soul Growth, Altered States of Consciousness and Awareness, Ancient Mystery Traditions and Arcane Knowledge, Comparative Religion, Sacred Scripture, Qabalah, Universal Law, Holistic Healing and many other facets of human existence. 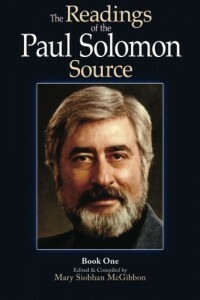 Answers to almost every conceivable subject are available through The Paul Solomon Source Readings and lectures. His gift of being able to communicate clearly the essence of universal principles, both ancient and modern, has inspired people all over the world to find their uniqueness, thus ‘re-membering’ their own connection to Source. “The Source Readings, impressive as they are, are only a means of revealing what lies beyond the words and beyond the wisdom. They are great only if they give you a glimpse of their Source. If they cause you to see the Source, then they have succeeded. If they cause the Source to be awakened within you, then they’ve really done what they are supposed to do.” Paul Solomon This first book is comprised of the readings that Paul gave towards the end of his life during the period of December 15, 1993 – May 28, 1992. Mary Siobhan McGibbon, grew up in Belfast, Northern Ireland. A life-long researcher and student of spirituality, she is the author of The Solomon Keys, a collection of Paul’s sayings that have given meaning and purpose to her life and inspiration to others. She now lives in Ireland.